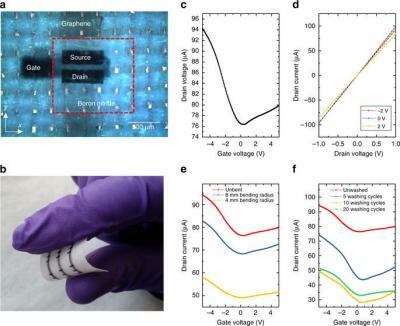 Researchers from Cambridge University have demonstrated how graphene and other related 2D materials (namely hBN) can be directly printed onto textiles to create fully inkjet-printed dielectrically gated field effect transistors (FETs) with solution processed 2D materials. According to the team, these devices are washable, flexible, cheap, safe, comfortable to wear and environmentally-friendly, essential requirements for applications in wearable electronics. The team also demonstrated the first reprogrammable memories, inverters and logic gates with solution processed 2D materials by coupling these FETs together to create integrated circuits, the most fundamental components of a modern-day computer. The devices reportedly achieved an average field-effect mobility of μn = 150 ± 18 cm2 V−1 s−1 when printed in a coplanar structure on PET and μh = 91 ± 29 cm2 V−1 s−1 on polyester textile.